Chop the dried plums and prunes into small pieces, about the size of a sultana. Place with the vine fruit in a large bowl. Pour over the brandy, orange zest and juice, mix well then cover. Leave overnight until the liquid is absorbed. Add the remaining ingredients and beat until well combined. Grease 8 x 175ml individual pudding basins then line the base of each with a disc of non-stick baking parchment. Spoon the pudding mixture evenly between each basin. Cover with pleated pieces of buttered foil (the fold allows for expansion), with the buttered sides facing the puddings. Fold the foil over the edges of the basins and tie with kitchen string so no steam can escape. Arrange the basins in the base of a steamer, then put the steamer on top of a saucepan filled with cold water. Bring to the boil, then simmer for about 2–2½ hours. Remember to check the water level regularly as it will need to be topped up with hot water to prevent the pan from boiling dry. Allow the puddings to cool, then discard the foil and replace with new pieces. Store in the fridge or freezer for up to a month. To reheat the puddings on Christmas Day, steam or simmer in water for 1-1½ hours until piping hot. Turn out on to warm plates and flambé with brandy and serve with brandy cream. 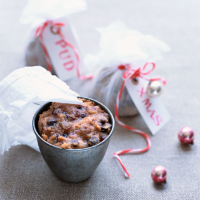 If you prefer, you can make a large 1.2 litre pudding – cook it for 5 hours in step 4, topping up regularly with boiling water, then reheat for 1½ hours on Christmas Day.